Is your wallet feeling extra light? Are you rationing your meal plan points? Even if you’re successfully balancing a budget, it sounds like you could use some extra cash. Being a student is expensive; textbooks, school supplies, housing, and food add up quick. 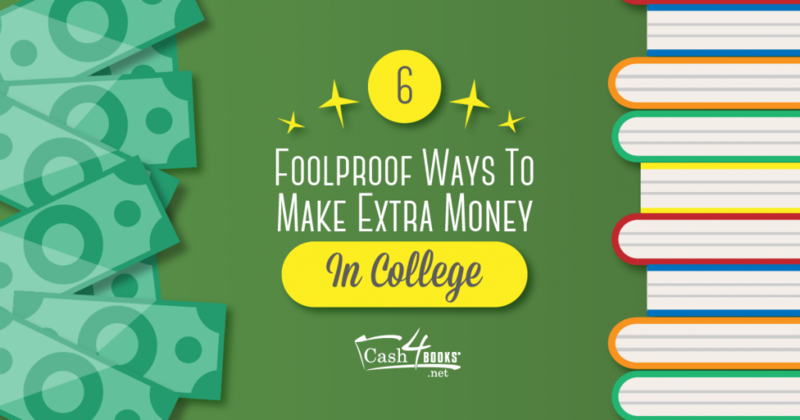 Take a look at these 6 foolproof ways to make extra money in college, and make life a little easier. Many universities have tutoring programs, where students who are excelling in particular classes get paid to tutor their struggling classmates. Whether you participate in one of these programs or set up your own tutoring arrangement, it’s an easy way to get several hours of work each week without taking on a full time job. Many universities also hire student note-takers. This means you can get paid for taking notes in classes you’re already in! Taking great notes is a worthwhile skill, so buff up on your note-taking strategies and go make some extra cash! There are countless work-study jobs in the library, lifeguarding at the student pool, manning the front-desk of the rec center and more! Snagging a few hours of work each week folding towels, answering phones, and filing paperwork are great for padding your wallet. A more unconventional approach to student employment is freelance writing. Put your college education to work, before you even leave school. Here’s a great list of blogs that will pay for your tips and stories. Check it out! If you’re an artist at heart and are always snapping photos, consider selling some of your pictures to a stock photo site! You’ll be able to explore your creative side and make cash in the process. Additionally, sites like iStock Photo and Shutter Stock are almost always hiring contributors. Check out this list of sites for more stock photo sites. Another awesome way to make extra cash is to sell your old textbooks! Whether they’re from last semester or last year, there’s usually no reason to hold on to your used textbooks. Head to our homepage and get a price quote on your books. It’s time to make extra money! This entry was posted in College Students and tagged college, College Advice, college life, college students, make money on October 14, 2015 by Jim McKenzie Smith.